Having discussed the demand side of the price theory, we now proceed to discuss the supply side, Supply side relates to the production of goods and services. Production of goods depends on the cost of production which in turn depends on the prices of inputs or the factors of production. Cost of production is determined by the physical relationship between inputs and outputs. In the theory of production, we largely discuss the relation between inputs and output. Production in economics is generally understood as the transfiguration of input outputs. The inputs arc what a f inn buys (i.e., productive resources) and outputs (i.e., goods and services produced) what it sails. Apart from physical changes of the matter, production also include services like buying and selling , transporting and financing. But in economic analysis we restrict the use of the term ‘production’ to the production of goods only. because in the .production of goods we can precisely specify the inputs and also identify the quantity and quality of output. In the theory of production, we study the factor of production and their organization. We also study the laws of production, i.e., the generalizations governing the relations between the outputs and inputs. We shall also study the theories of population which govern the supply of an important factor of production. viz., labour. We shall also study the ‘production function, i.e., the relation between the output and inputs. 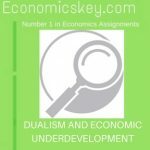 Economic analysis and it has a great 4 e to the study of various economic problems. 11 of production plays an important role in : of relative prices. Specifically. (a) it helps analysis of relations between costs and volume put. it tells us how a manufacturer combines an s inputs in order to produce a given output in an anatomical, clientele manner, i.e., at the minimum cost. (b) The theory of production also provides a e for the theory of the demand of firms for productive resources. Thus, we that the theory of production has a great relevance to the theory of firm. A firm seeks to produce that level of output at which its profits are maximum. For this purpose, it will have to consider the marginal and average cost of production besides considering the demand conditions, i. e., average and marginal revenues. We shall first study the various factors of production in this chapter and then in the next chapter the forms of entrepreneurial organisation, Then in the subsequent chapters, we shall study the population theories, the scale of production, tune production possibility curve and production function, the laws of returns. the quadrants or equal product curves, cost and cost curves and supply. This will complete the study of the theory of production.